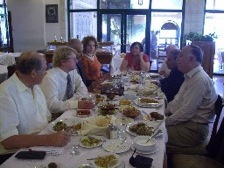 Participants at a Middle East Peace Initiative event in Jerusalem today sat around a breakfast table and discussed the current state of play in the region with members of local organisations that are directly or indirectly involved in negotiating a solution to the Israel Palestine conflict. Daniel Seidemann who is Legal Advisor to an organisation called Ir Amin which deals with Israeli-Palestinian relations within Jerusalem, spoke passionately about the history and of the struggles within the city but also of the friendships that still exist even between right-wing Israelis and Palestinians. Gershon Baskin of the Israel-Palestine Centre for Research and Information, which covers issues that need to be negotiated for a resolution of the Israeli Palestinian conflict, works with a team that includes both Palestinian and Israeli academics. He explained a hope that a fifteen year reunion of the Madrid Talks could serve as the basis for a ?Madrid Talks Two?. Ran Cohen MK (Member of the Israeli Parliament, the Knesset) explained the current political situation. He was one of few who had called for an early end to the war and negotiations with Syria. He maintained that the Labour party and the governing coalition with Kadima were very unstable. The budget had not been agreed and therefore the government could only stay in power until March 2007 when the money would run out. Dr Hadi Abdul Mahdi, who is Chairman of the Palestinian Academic Society for the Study of International Affairs provided a Palestinian perspective of the conflict. 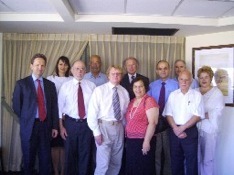 He was joined by Dr. Emil Jarjoui, a Fatah Palestinian Legislative Council member. Dr. Mahdi explained that just two days earlier on Al Jazeera television he had called for the resignation of President Abbas. It had caused a big shock as they are personal friends. But he said that the Palestinian people were looking for a new leader who could bring new solutions to end their suffering. When asked how trust could be built in order to agree a treaty he said that of necessity it had to be through third parties and suggested that it could be a role for the Middle East Peace Initiative as well as other groups involved in such work. He said that the time has come not to see themselves as Israelis or Palestinians but as human beings.